As the snow begins to melt, temperatures start to climb and the days get longer, you might start thinking about making a change. If you are in the process of selling your home and have some flexibility in your schedule, spring can be the perfect time to move. Moving in the spring has several benefits, from the ease of packing to providing additional time to settle into your new digs. Packing up your belongings will be a challenge regardless of the season, but the relatively cool days of spring allow for a more pleasant experience. Lifting boxes in extreme heat or frigid temperatures can add stress and agitation to your move. Spring often has stretches of clear days with reasonable weather, making the strenuous work more tolerable. Moving in the spring allows you more time to unpack and settle in your new home before the rush of summer vacations and socializing. The extra few weeks to unpack and make your home your own provides you with an opportunity to relax and enjoy your new location. If you are looking to pack up for your move in the early Spring, you have the benefit of having your kids home for spring break to help and move boxes, depending on their age range. 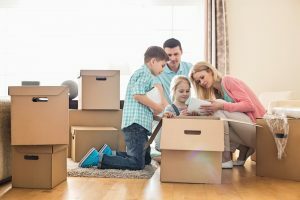 If your children are too young to productively help with the process, you can pack and schedule your move to occur while they are still in school. Moving companies usually have more flexible schedules in the spring, allowing you to pick the perfect timeframe ahead of time. Most people move in the summer or late Spring, leaving most of the season to coordinate your move. If you are in need of professional movers, contact Flannery’s Handymen today! Whether you are moving down the street or several states away, our team will safely load your boxes into one of our trucks and get your belongings to your new home in one piece. Flannery’s Handymen can be reached by calling 781-775-9943 or by filling out our online contact form.